This is a 1.5 inch by 25 yard grosgrain ribbon with a trendy sports print. This ribbon is part of our “Team Spirit” fashion trend. The “Team Spirit” fashion trend allows you to show where your allegiances lie with the colors of your favorite team, or celebrate your favorite sport. This ribbon features multiple different sports balls, in various school or professional team colors. The print is a full color print on one side only. 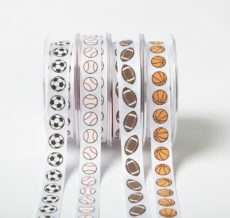 Mix and match this ribbon with our plain grosgrain or satin and more to create unique designs celebrating your favorite sport. Our woven grosgrain is more durable than traditional cheaper grosgrains that are made from cut fabric, which means the ribbed texture will not fray or become distorted when you pull on it. A woven grosgrain also has slightly more weight to it, which also maximizes its durability. It is perfect for gift wrap, card making, sewing, scrapbooking, hair bows and home decor.